The SOCRADES project is a European research and advanced development project. Its primary objective is to develop a design, execution and management platform for next-generation industrial automation systems, exploiting the Service Oriented Architecture paradigm both at the device and at the application level. 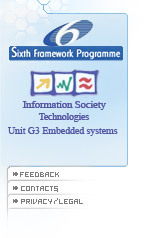 SOCRADES is a part of the Information Society Technologies (IST) initiative of the European Union's 6th Framework Programme. The SOCRADES consortium is made up of 15 partners from 6 European countries. It is led by Schneider Electric and includes the major European players in the industrial automation sector. The Project Coordinator of SOCRADES is Dr Armando Walter Colombo (Schneider Electric Automation GmbH), who is the Schneider Electric Edison L2 Group Senior Expert, also serving as Programme Manager for Collaborative Projects in the Industry Business Unit. The complete phamplet-version of the SOCRADES Roadmap is now available in the Documents section. SOCRADES presented final results of the project in ITEA 2 Symposium that was held in Madrid (October 29-30th, 2009). A new article on SOCRADES results has been published in Projects of British Publishers. Please have a look at the article through this link: British Publisher Article. A new set of videos showing SOCRADES features is now available on YouTube. These videos present different features of the technical achievements reached in SOCRADES. Please have a look at them through the Pilots section. SOCRADES Technology Roadmap Survey has been done. Results are included in SOCRADES Roadmap that will be available soon on SOCRADES Website. Several videos concerning the latest results coming from SOCRADES Demonstrators are available. You can have a look at them through the Pilots section. SOCRADES participated to ICT 2008, the Europe's biggest research event for information and communication technologies. ICT 2008, was held in Lyon, France, from 25 to 27 November 2008. See available exhibit details. SOCRADES participated to ITEA 2 Symposium 2008, held in the â€˜Port of Europeâ€™ Rotterdam, the Netherlands from 21 to 22 October 2008. Results achieved were presented even through demonstrators and posters.